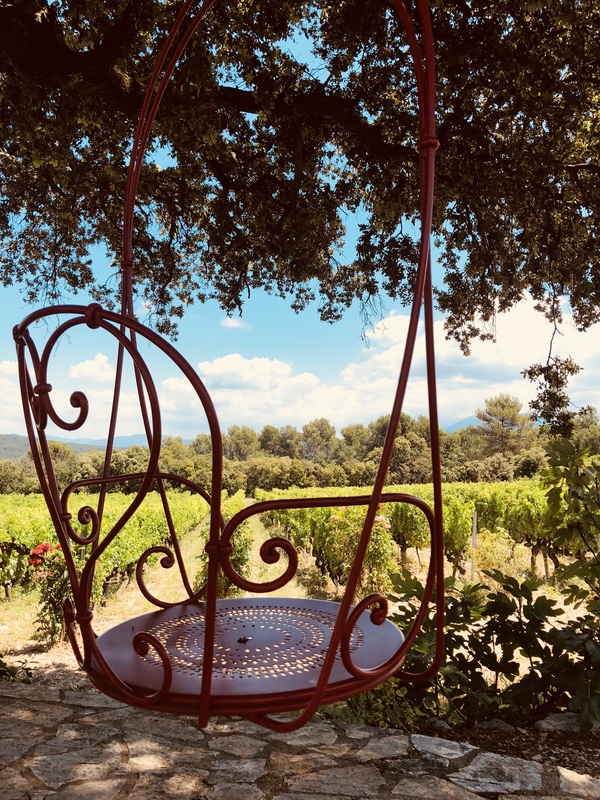 “Wake up and look for the happiness and share it.” —thoughts about life shared at one of the many lunches enjoyed with Patricia and Walter Wells on their terrasse in Provence. 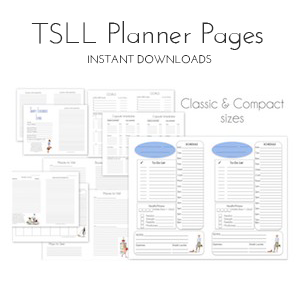 There are many different ways to learn any new skill, acquire any new information, to understand new-to-you concepts. For some, becoming accustomed to direct lecture, a receiving and taking in of information from the professor or expert on the topic is well established and has been utilized for ages. For others, indirect, hands-on, experiential learning is, while lesser known and practiced, is a far more effective method for the student to absorb and retain the desired content, and often while requiring immense preparation by the professor/expert, a deeply rewarding experience as observations of understanding are witnessed at any given moment as the student immerses themselves fully into the experience. 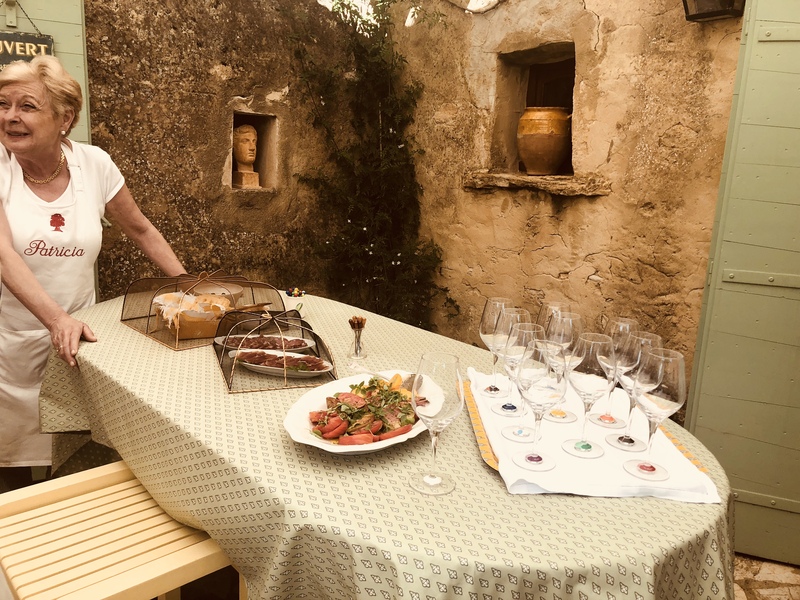 Cooking in Provence with Patricia Wells was a week-long experience of not only cooking, but preparing, experiencing, engaging and enjoying the way of living in Provence with the seasons, the culture, the food and leisurely pace. And it was the approach of experiential learning that was deeply influencing and inspiring. I honestly cannot remember how I first learned of Patricia Wells’ cooking classes, but I did have a few of her cookbooks (and quickly acquired a few more as she published this one and this one – both are two of my favorite all-time cookbooks), but I did, and in 2011, I ardently wanted to partake someday. Keep in mind in 2011, the reality of this happening was but a dream. However, I wrote down attending one of her classes as a reward for publishing my first book. My first book was published in 2014, but as life often happens, other plans became a priority, and a move to Bend took place first in 2015. However, in the back of my mind, I had not forgotten the promise I had made to myself. 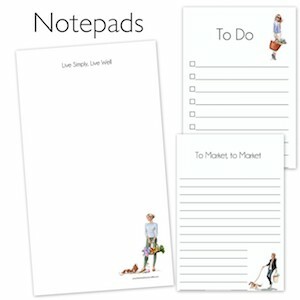 In the summer of 2015, just a month after arriving in Bend, I received Patricia Wells’ seasonal newsletter (be sure to subscribe if you too are interested in taking one of her classes) which will announce when sign-ups have begun for her offerings (the spaces are limited and they go VERY quickly). 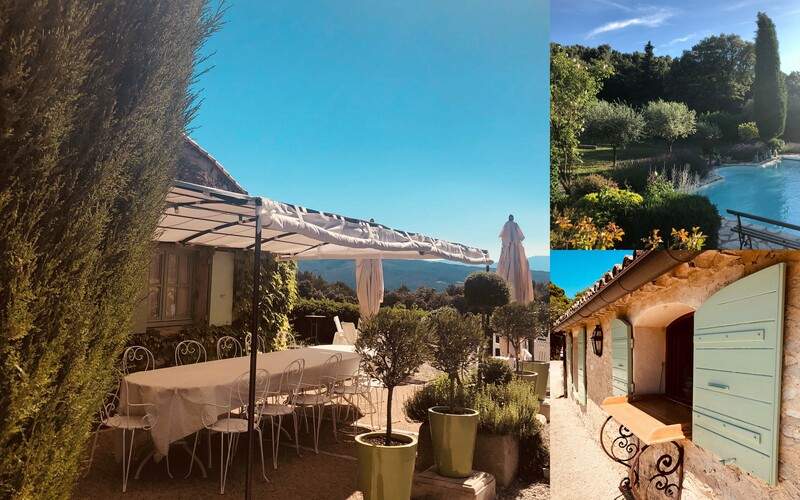 Well, after a few days of considering what I might be doing in the summer of 2017 (classes are opened two years in advance), I decided, yep, traveling to Provence that summer would be wonderful (not a tough question to answer, as you might imagine). But, nope, I had waited too long to contemplate this simple question. It was too late. The class was full (you can be put on a waiting list). 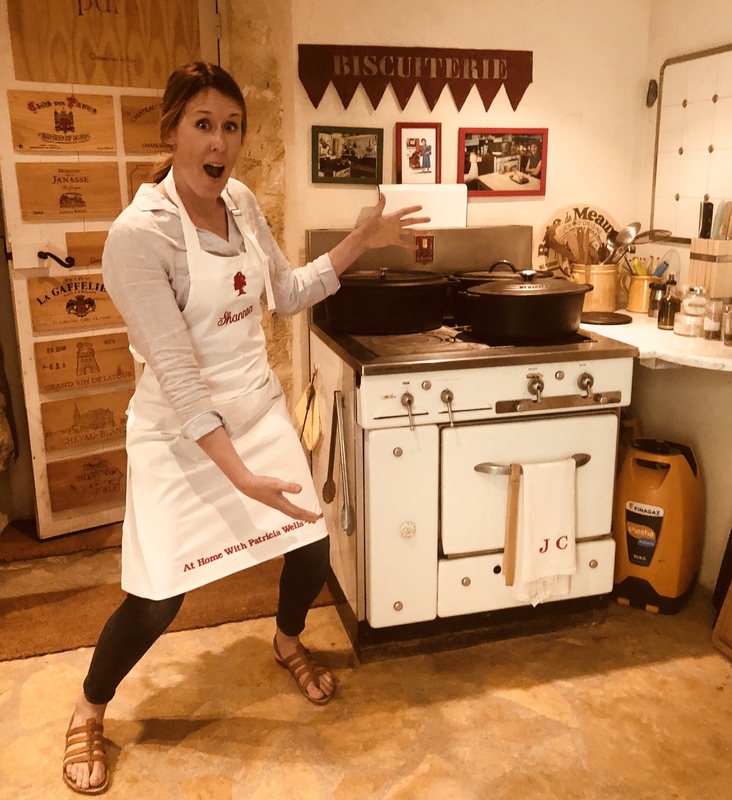 But back to the story of Cooking with Patricia Wells! 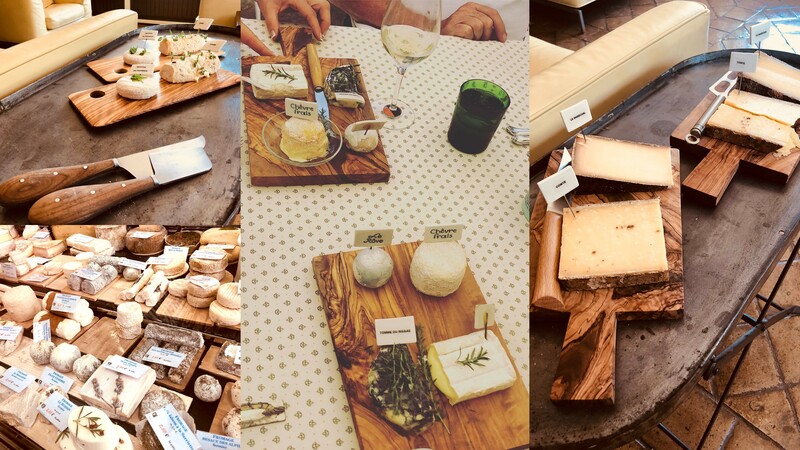 The first official meeting and gathering of class was to be Sunday evening on June 24th, and so understanding jet lag would be something to navigate, I decided to land in Paris on the 21st and hope that by the 24th I would be pretty much 100% me. 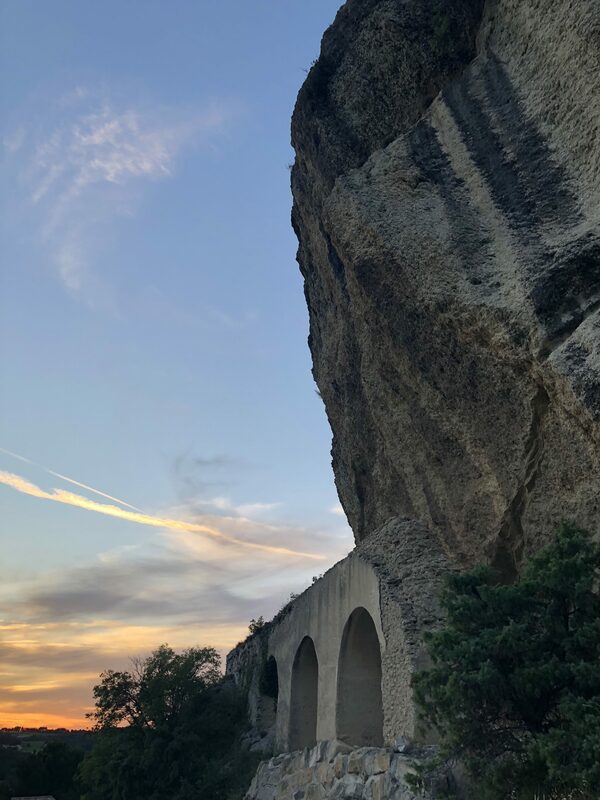 While I did sleep on the TGV train down to Avignon the day before, for the most part, I was rested and ready. 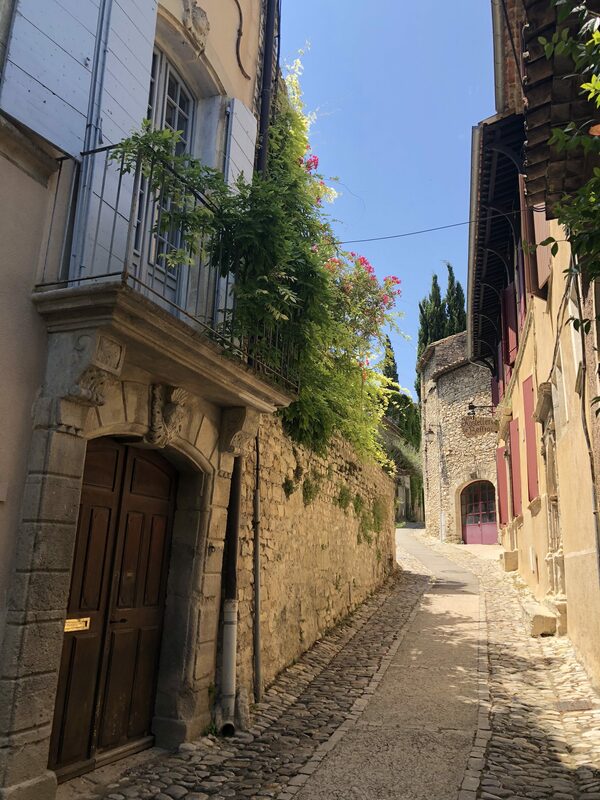 And oh, what a splendid sight was Provence to someone who has never with her very own eyes seen it before. 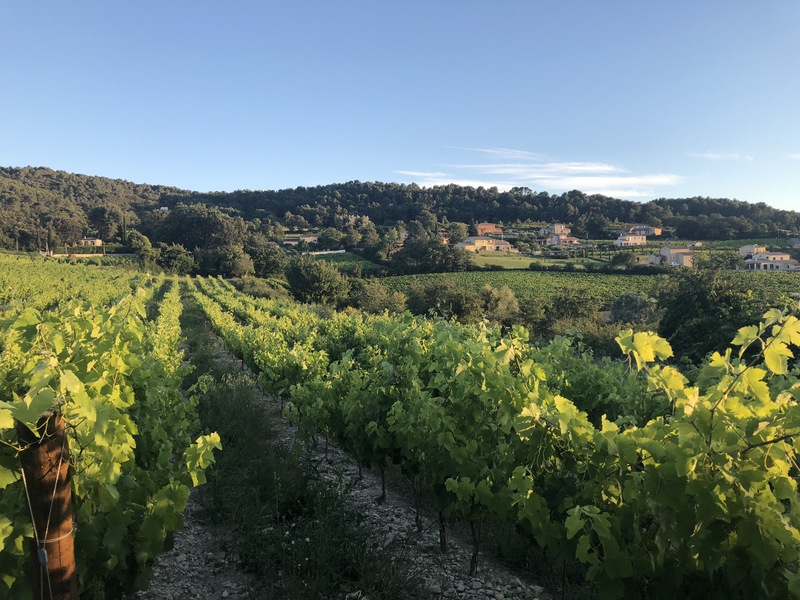 The cerulean blue skies were ubiquitous during my entire eight days in Vaison-la-Romaine, and the mistral was but a gift on the warmest of days to offer a drop of temperatures in the afternoon. The medieval town, which was where I found my vacation rental, offered a taste of living atop many centuries old ruins. The history of the town, the cobbled streets and brilliant stone construction, along with the blues, greens and reds painted upon the shutters are images I still cannot quite believe my eyes enjoyed day after day as I walked to and from class and down to the city center from time to time to pick up a croissant, visit the shops or pick up some wine. Each day of cooking – Monday through Friday – we would arrive and be assigned one of the recipes which would be part of our lunch. We were always assigned something different each day to ensure we had the opportunity to explore different types of courses. Sometimes we worked as a pair and sometimes solo. Either way, we were sharing the kitchen with at least one of the other eight students as well as receiving guidance from Patricia and Walter along with the “angels” as they were called, the two women who made everything run smoothly. While we cooked, aperitifs were made as well and enjoyed as seen below. There were two kitchens we cooked in. The one below was where Patricia’s La Canache stove was placed, and it was a treat to cook on. 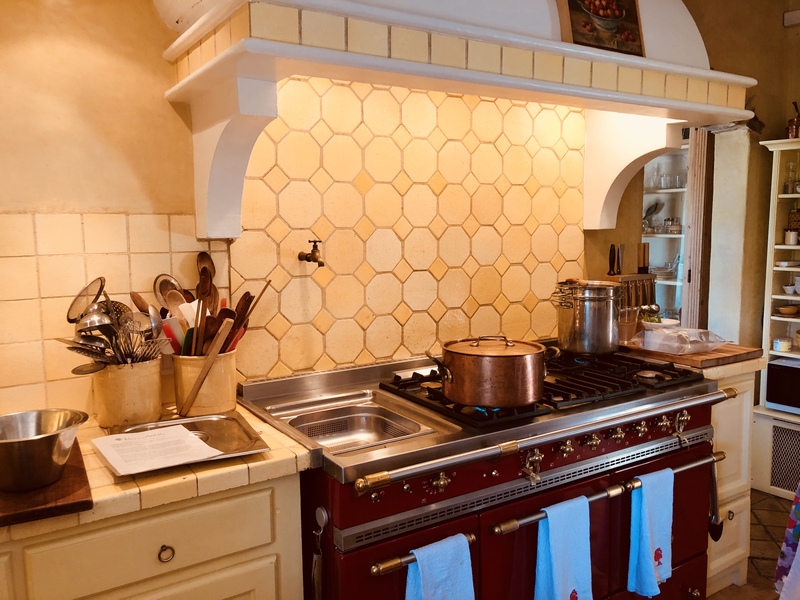 Complete with a steamer which was where the Zucchini Blossoms stuffed with Goat Cheese were prepared, the stove was as beautiful as it was highly functional. 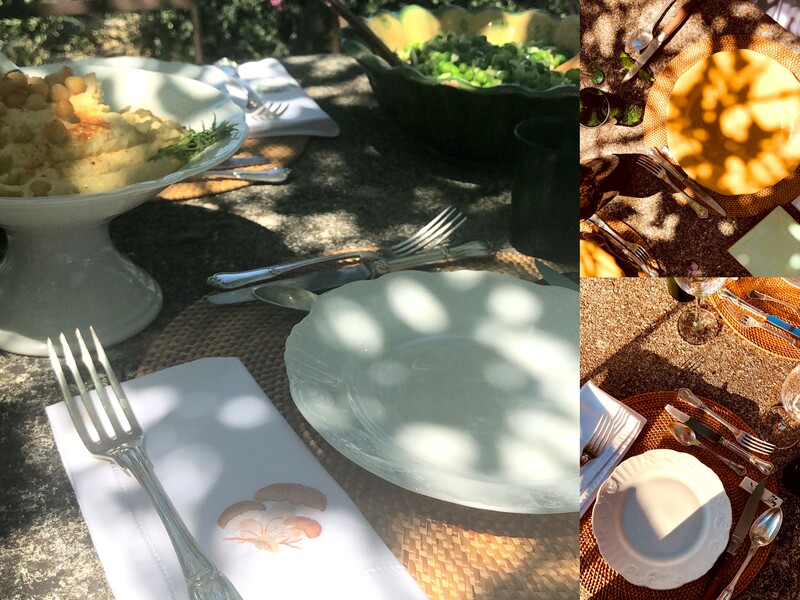 The meals we prepared were seasonal with ingredients coming from either the local market or Patricia’s garden. 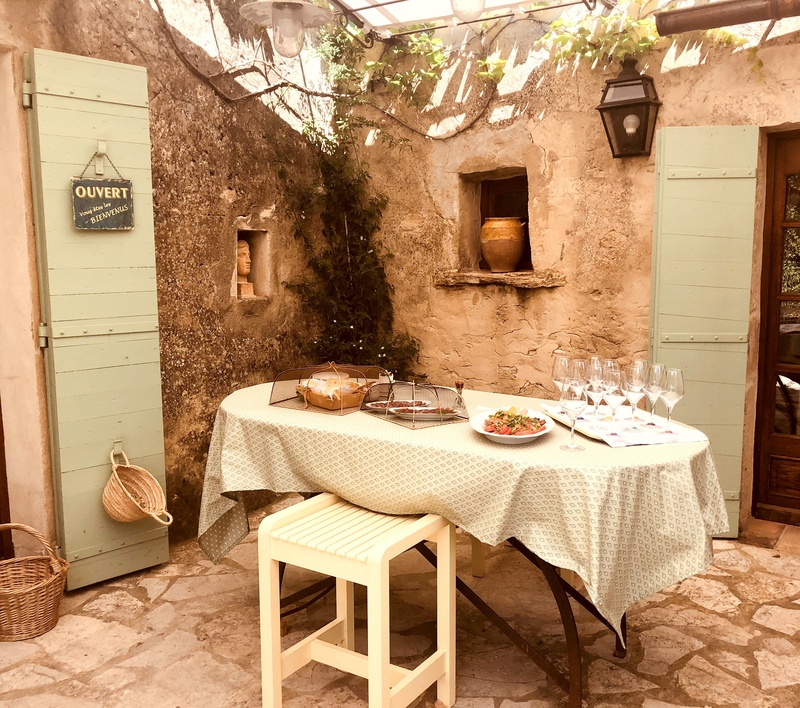 Each meal consisted of at least four courses, and for Monday’s main course, the traditional Provençal vegetable soup, Soup au Pistou, was enjoyed. As an introduction to white beans with this dish, along with the fresh vegetables, the beans were heavenly, and now something I look forward to enjoying often in the future (although they are very hard to find). While there were many lessons and takeaways regarding cooking and seasonal ideas, I will admit, one element that is lacking in my own recipe repertoire is soups. And so I was quite thankful for the many different summer soups we made and enjoyed. See below: Soupe au Pistou, Chilled Zucchini and Basil Velouté, and Chilled Cucumber-Yogurt soup. 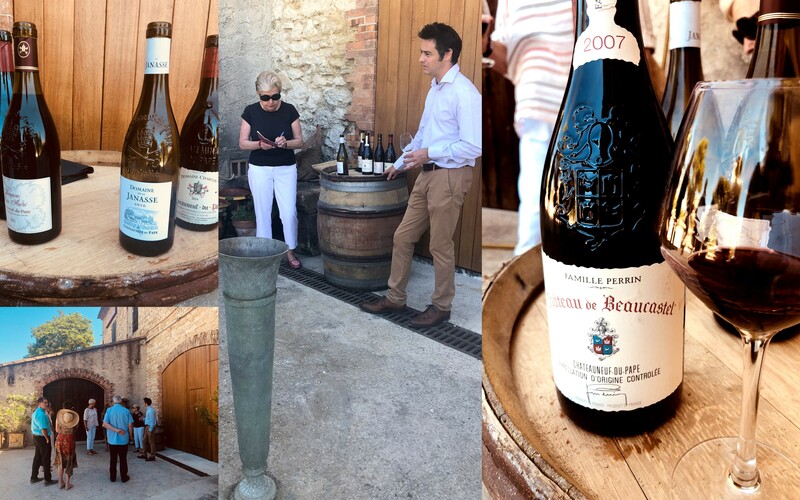 For one of the days of the week, we went away from ‘campus’ and enjoyed some wine tasting in Gigondas. 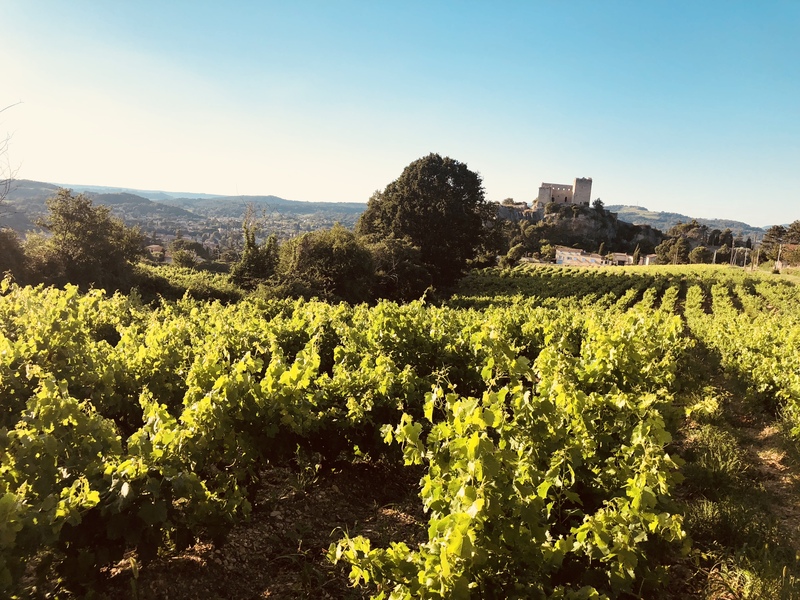 For the first time I tasted Chateauneuf-du-Pape wine, and now understand why everyone I know who knows French wine speaks so highly of them. 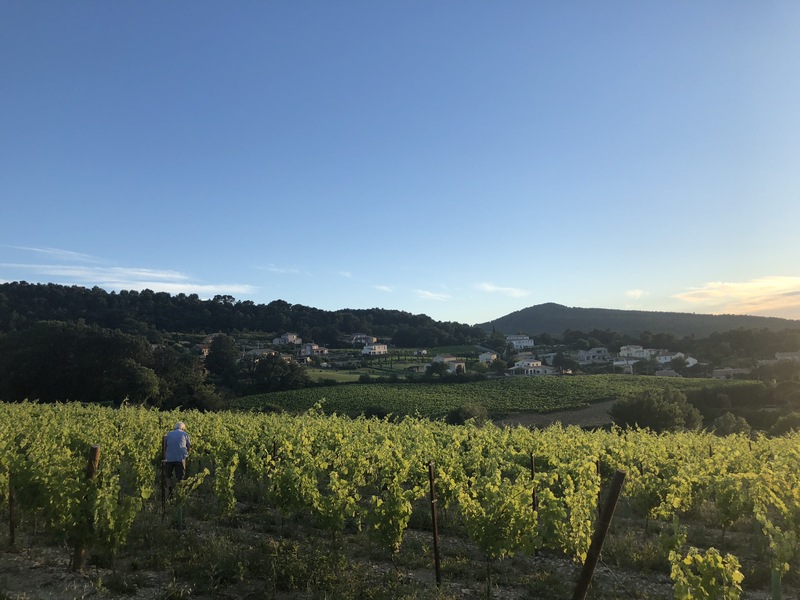 With the ability to use 13 different grapes as the region is rich in its offerings, the wine makers have a myriad of combinations and oodles of expertise and time on their side to create some magnificent vintages (as well as the Provençal sunshine and climate). 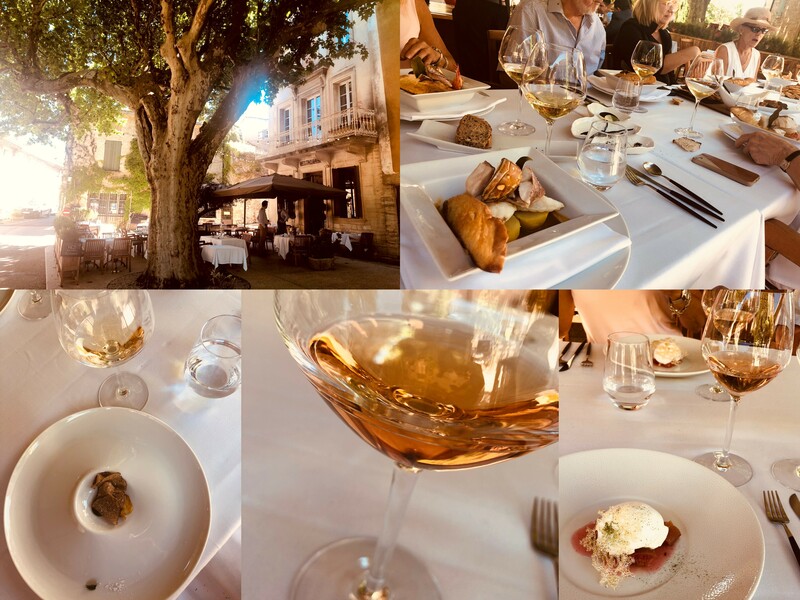 After wine tasting, we enjoyed our lunch complete with four (perhaps five, now that I am thinking about it) courses at L’Oustalet by chef Laurent Deconinck. 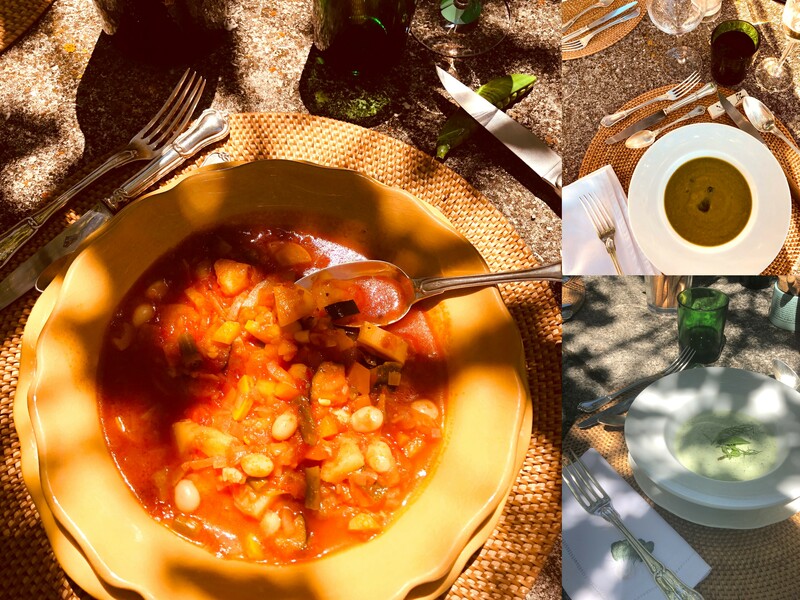 The bouillabaisse was again, like many of the Provençal dishes I enjoyed, my first, but perhaps forever the best I will ever enjoy. 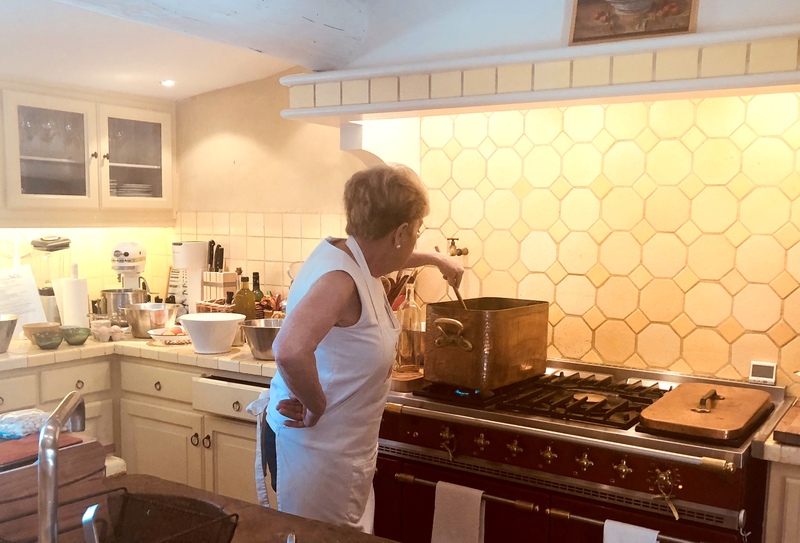 One member of our group inquired about the recipe; the chef politely mentioned, it was his grandmother’s and the discussion was playfully brought to a close. (I don’t blame him. It’s that delicious.) Our first course (seen in the lower left-hand corner) was a bite of summer truffles, and the dessert (the lower right-hand corner) was a rhubarb subtly sweet treat. 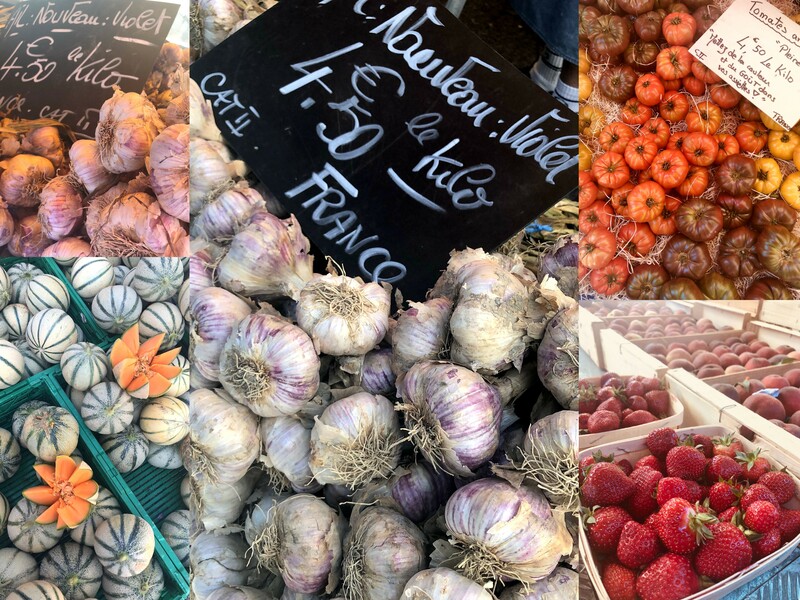 I quickly came to enjoy that each day of the week, somewhere in the region, there is an outdoor market for fresh produce. 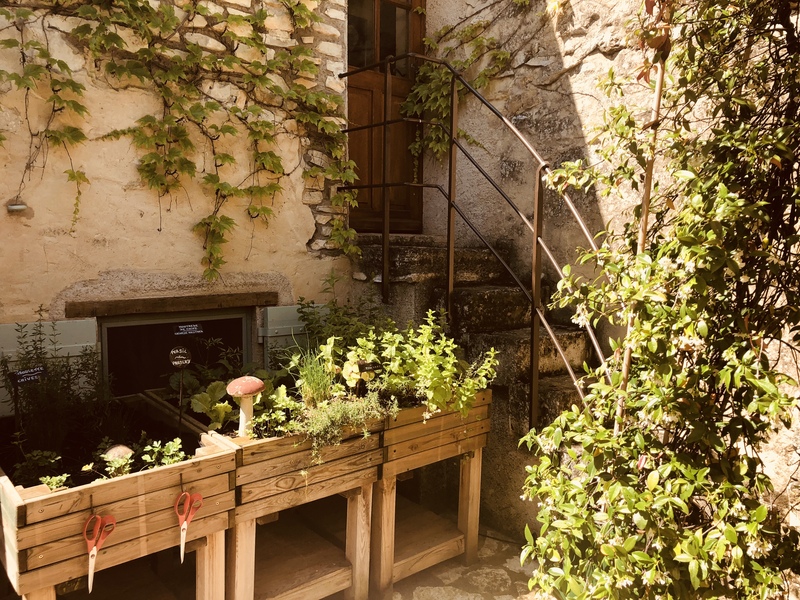 In Vaison-la-Romaine, that day is Tuesday, every day, year-round. 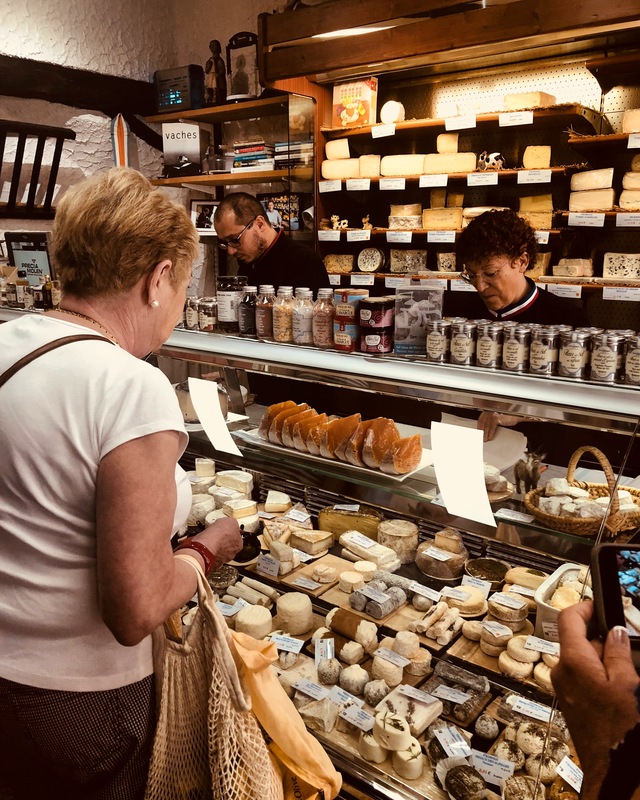 And so it was on Tuesday morning, the class, led by Patricia, went to the market to pick up what we needed for lunch (monkfish and zucchini blossoms were on the list). Be sure to check out the video at the end of the post to see more of the market excursion. 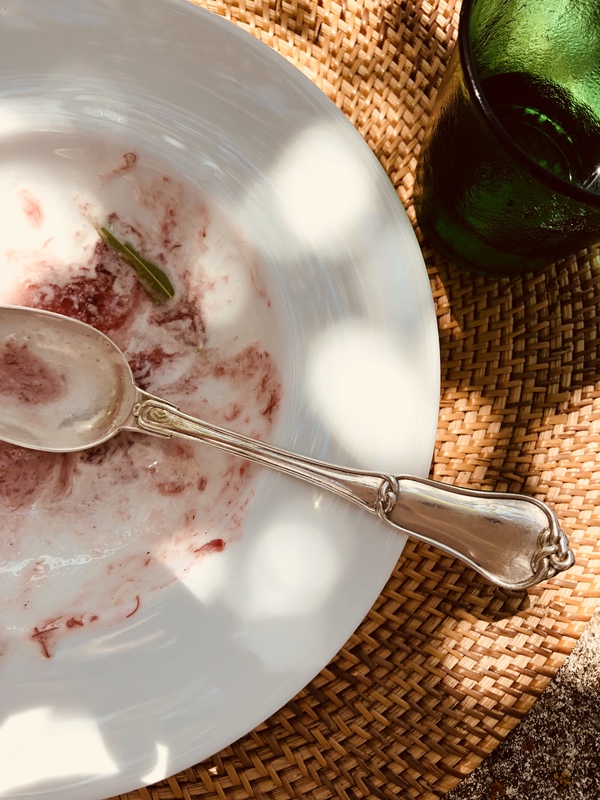 Each lunch concluded with dessert, and the desserts were simple, yet flavorful and tasted of summer. 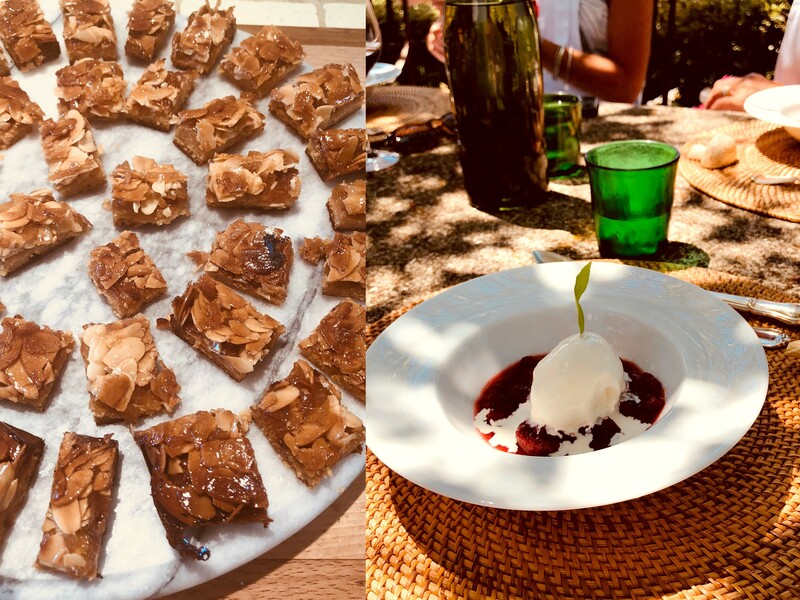 See below – left: Ginger & Almond Bars; right: Rhubarb-Berry Compote with fresh Lemon Verbena Sorbet. The details of each meal, the French silverware set complete with a Gordian knot, the unique green water glasses with matching carafe most likely found at a brocante and the simple, neutral chargers and white plates elevated the food even more as we were enjoying an experience, and time was not minded. To say I had a memorable experience would be to state the obvious. 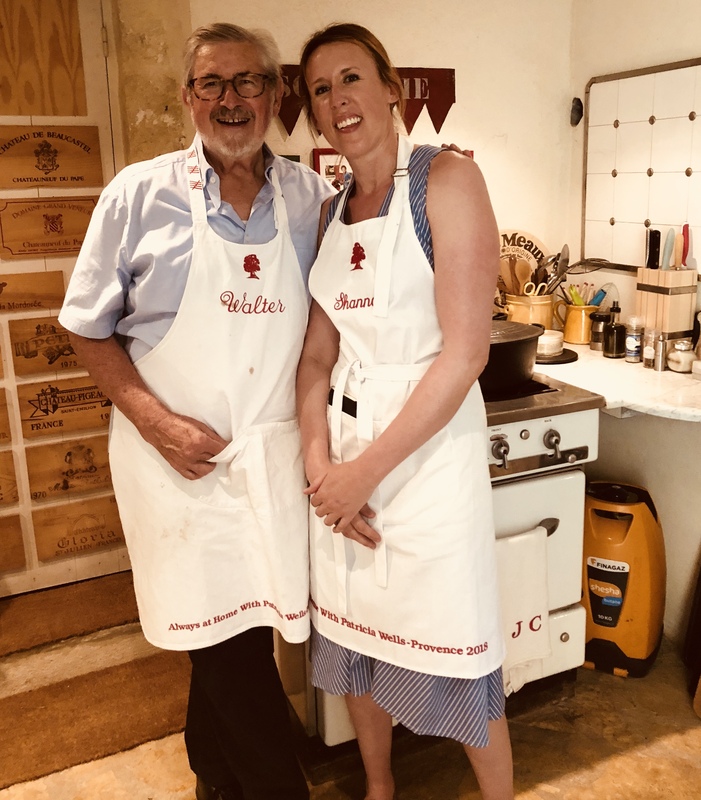 I know I will most likely never have such a delicious, eye-opening and magical time with people from around the world that were a joy to work with, as well as the expertise and experience of the Wells as I did this summer. Our group was kind, curious and truly a fortunate combination of good spirits and good will. The universe was generous with its good fortune. 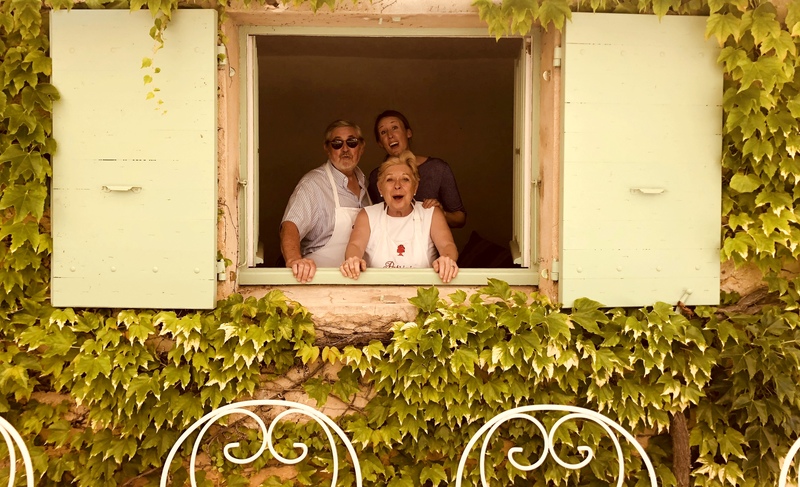 And as Patricia and Walter have opened up their home to so many, she shared that to do so and to call Chanteduc home was a dream come true. And in so doing, they have enabled others to make their own dreams a reality as well. None of us can be sure exactly how the future will unfold for us, but we can put the cards in our favor. We can choose today to invest, to have a vision, even if nobody else can exactly understand what we are working so hard to enable to materialize. As Walter shared in one our group’s many existential conversations, “Happiness is a choice.” And to look at what he and Patricia have built, they have chosen to invest in a happy life. Not everyone’s journey will look the same; in fact, if we are being true to ourselves, it will look exactly like no one else’s, but we can draw inspiration from how others have navigated through life, and all the while chosen to be happy along the way. Thank you Walter and Patricia for sharing this week with us all. It was a dream come true. Have a look at the short video below which will take you through the week in pictures and mini videos. If you did not get the chance to see my Instagram Stories, this video will catch you up, plus share a bit more. If you would like to view all of my IG Stories from my Tour de France, be sure to check out my IG Highlights as they are organized into Parts 1-10 (this week is shown in Part 3 & 4). 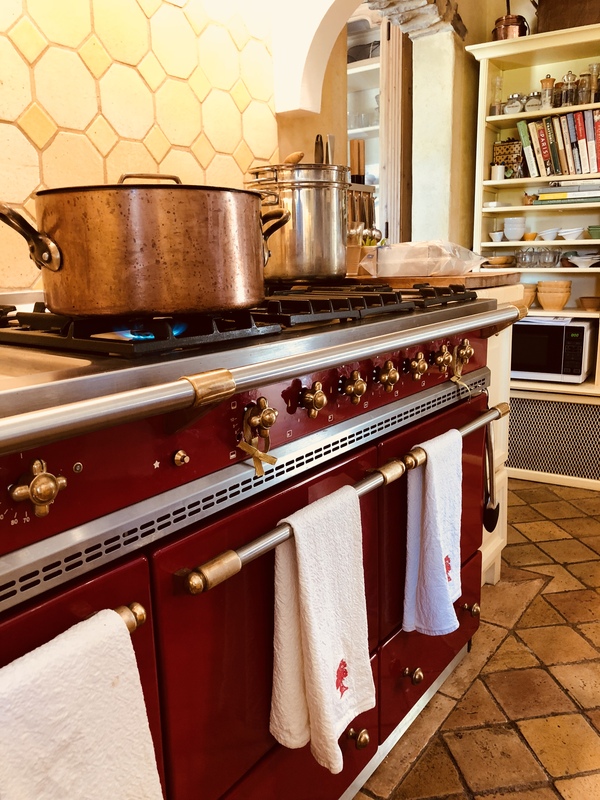 ~To learn more about Patricia Wells and her cooking classes, visit her website. What a fabulous video Shannon ! 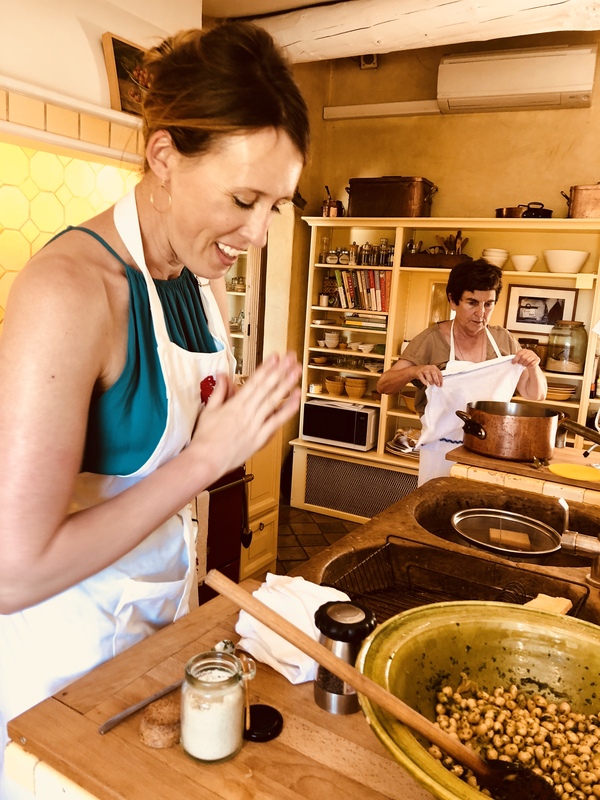 You transported me to Provence , the light, scents, tastes, and sounds,of the markets , wonderful scenery, delicious food , beautiful table settings , new experiences in preparing and cooking different dishes, and the fun and friendships made along the way. Not to mention THAT stove !! Wonderful memories , beautifully expressed. Merci Beaucoup , vraimant , c’est un grande plaisir ! Thanks so much for the lovely stroll down memory lane! 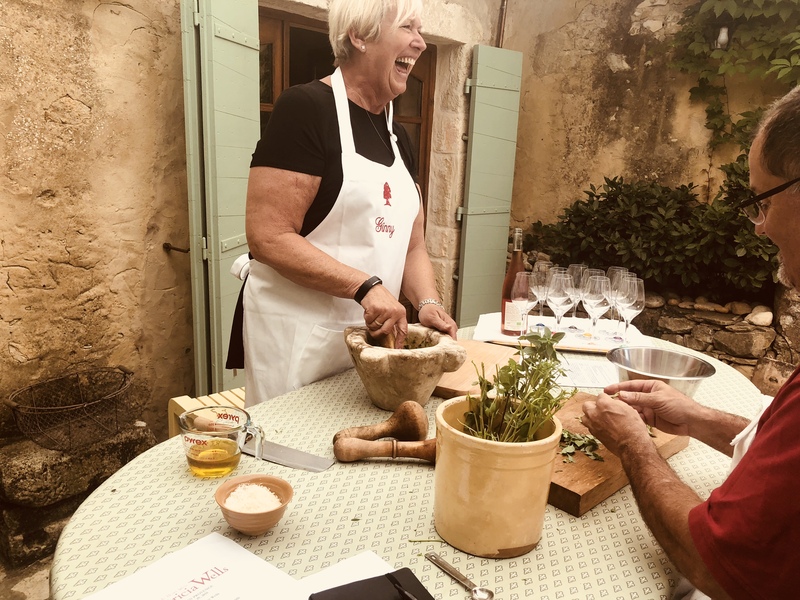 My husband and I took Patricia’s class in Provence 1997, when she was still pretty new at giving these classes. Walter was not yet retired from journalism then, but happened to be there that week, so we became good friends with them both. It was a magical experience and one we think about often! 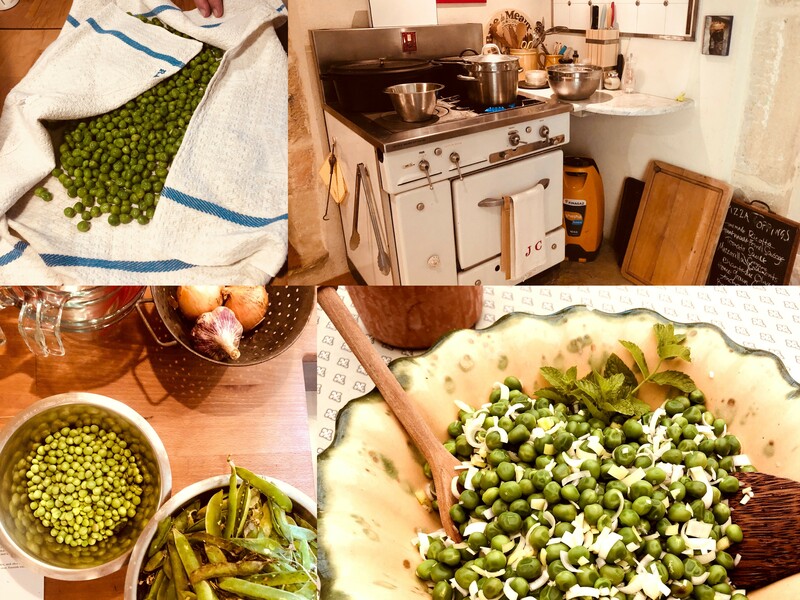 We now live part of the year in the Languedoc, 2 hours from Vaison-la-Romaine, and still use so many of the ideas we gleaned from Patricia, in our everyday cooking. My favorite phrase from her was “Love your food.” It is so simple and yet, kind of says it all. 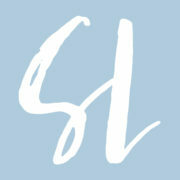 You might enjoy my blog (unlike you, I am only an occasional writer!) It’s La Joie de Vivre (https://cestsibon.blog). I have always thought about writing a post on how our class with Patricia changed our lives. Maybe someday…but I just loved reading yours! Thank you so much for sharing your experience Kate. 🙂 Yes, Walter is such a gentleman. I thoroughly enjoyed my time with him. Having them both was wonderful as the stories they shared and knowledge they have gleaned over the years was insightful. Shannon, This was lovely. 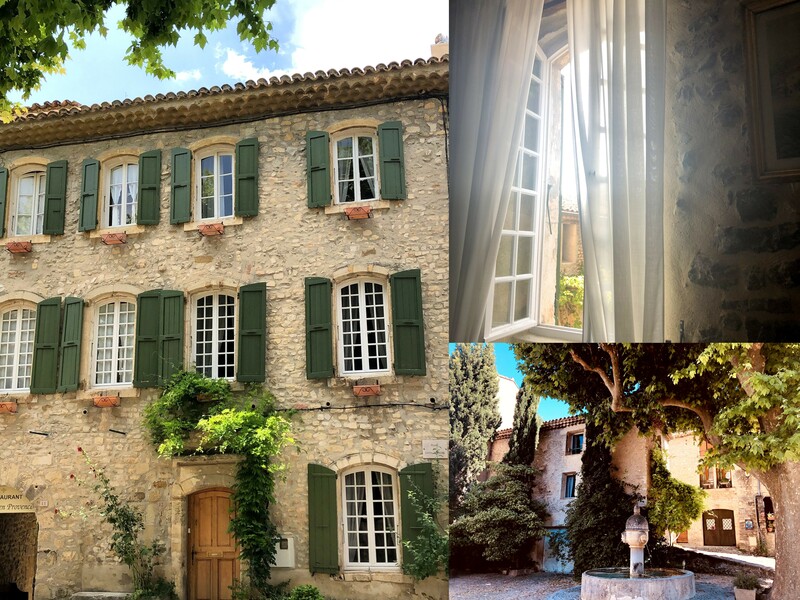 I began my day with you in Provence…nothing better if I’m not there in person. I am usually traveling solo. 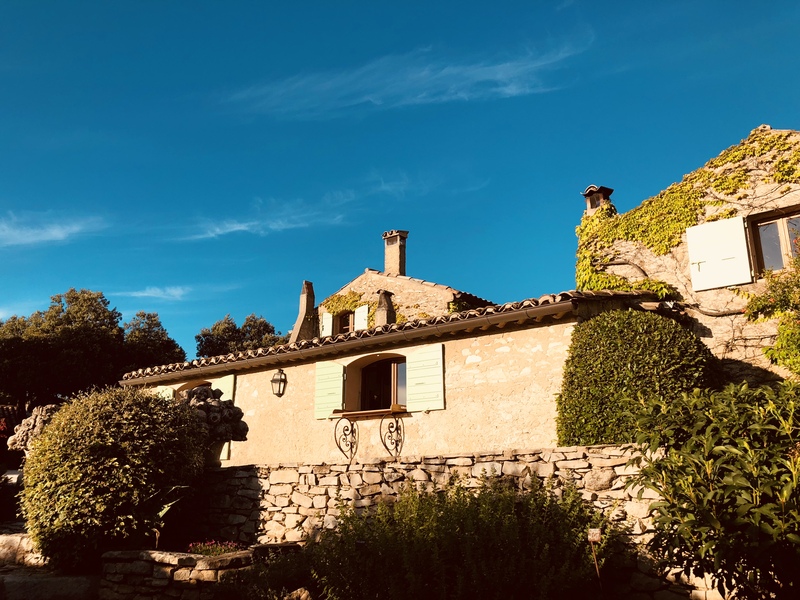 Is the haute Ville area of Vaison-la-Romaine, easy to get to from Avignon?? Did you hire a driver or rent a car? I’m always challenged with transportation once I’m out of Paris. Thank you and keep sharing!! Thanks Diane! It was an experience I will always treasure. It is hard to believe it has come and gone already. However, I am so thankful for this opportunity.